In mid 1938, Remington and the Federal Bureau of Investigation worked together to develop a replacement for the Winchester Model 1907’s that were then in service. The FBI had become dissatisfied with the .351 Self-Loaders and sought Remington to come up with an alternative service rifle that could produce similar ballistics but function more reliably. The Model 81 FBI rifle was Remington’s answer. This rifle, in actuality, was only a slightly modified version of Remington’s production Model 81 rifle. An excellent history and production development of these rifles can be found in John Henwood’s “The Great Remington 8 & Model 81 Autoloading Rifles”. 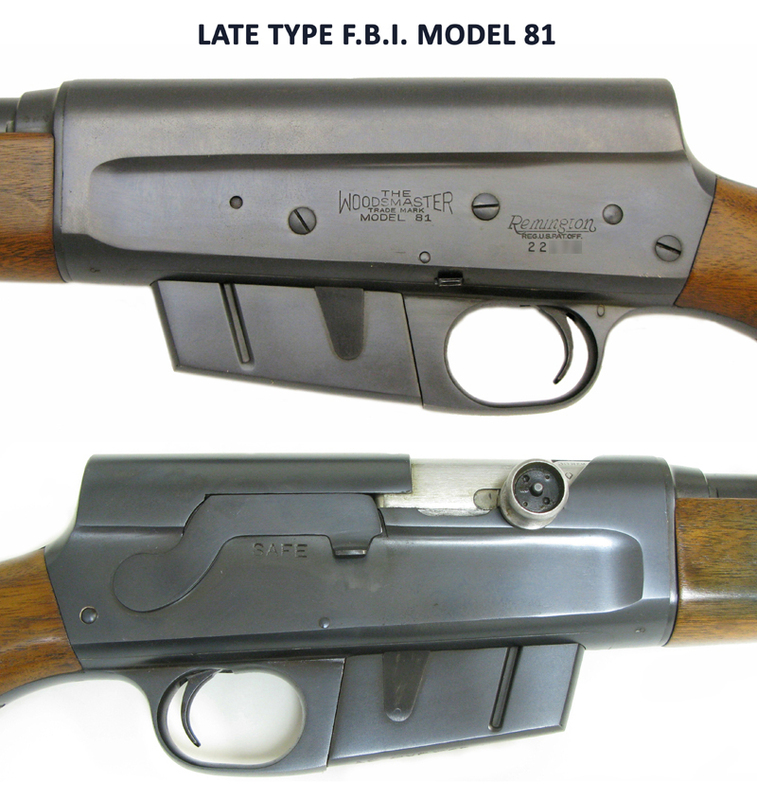 Two basic versions of the FBI Model 81 were manufactured. The following is to help the collector determine the differences of Early-Type and Late-Type FBI Model 81’s as well as their authenticity. This version of FBI rifle is the easiest to recognize. The most prominent features are the unique receiver markings and the Lyman 41R receiver sight. Please take note that the Early-Type comes in two configurations. One was manufactured without rear sight holes altogether, only a smooth barrel jacket. Another configuration was manufactured with rear sight holes and a factory installed Lyman #12 rear sight-blank. Both were represented in this study. “the writer, therefore, recommends the rifle set up in this manner (using 25Rem buffer springs) for the above ammunition, and from the rifle factor can see no reason why they could not be supplied; however, believes that there should be some special marking put on these arms. Nevertheless, a preliminary test shows that the rifles, as they are now setup, work satisfactory with the service ammunition, but do not recommend this change for all rifles of this caliber”. When Remington sent out a revision clarifying the changes to be made to the FBI rifles from the standard Model 81 on Dec. 27th 1940, there was no longer any mention of altered buffer springs, nor do we find special markings on production FBI rifles today. Therefore it is unlikely the reduced velocity 30Rem cartridges became standard issue for the FBI Model 81. – RECEIVER – Remington script and serial number were placed beneath trade name. – LYMAN 41R REAR PEEP SIGHT – mounted .5″ from the rear of the receiver on the left hand side of the rifle. – TAKE DOWN SCREW LOCK WASHER – dimensions – 7/16 x 5/8 x 3/32. – FRONT SIGHT – special tall blade sight using standard dovetail. Made specially for use with the Lyman 41R sight. 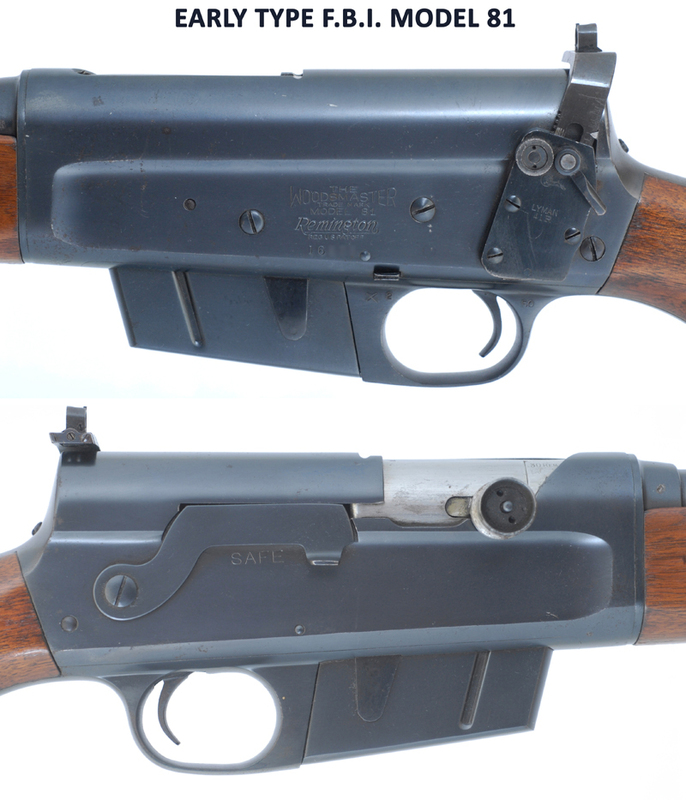 – BARREL JACKET – omission of rear sight holes and rear sight base plate on some rifles. Other rifles were manufactured with rear sight holes filled with a Lyman #12 sight blank. – STOCK DROP – increase in drop due to raising peep sight. Take-down lever comparison – Standard 81 (TOP) and FBI 81 (BOTTOM). Note lengthened screw and shoulder. * Witnessed on several Early Type FBI 81’s, is the letter “X”on the left side of the trigger plate just below the magazine indicator thumb piece (bolt release). Serial numbers from the studied rifles were in the 149XX – 199XX range. The rifle below was manufactured in 1941. For reasons unknown, specifications for the FBI Model 81 were changed in 1944. This later version of the FBI rifle is the most difficult to recognize. This is because they so closely resemble standard Model 81’s. Knowing what to look for with a close eye will help the collector differentiate this very rare version of the Model 81 from a standard production rifle. All of these Late Type rifles were still manufactured in .30Rem. During this study only three Late Type serial numbers were observed, all in the 221XX serial number range. Remington’s Methods and Planning Superintendent E.A. Walsh, put these new changes into a memo dated July 25th, 1944. – RECEIVER – same as standard Model 81, serial number in normal location. – BARREL JACKET – barrel jacket brazed to the barrel jacket head (to prevent loosening). Rear sight holes and rear sight now standard. – REAR SIGHT – standard Model 81 rear sight. 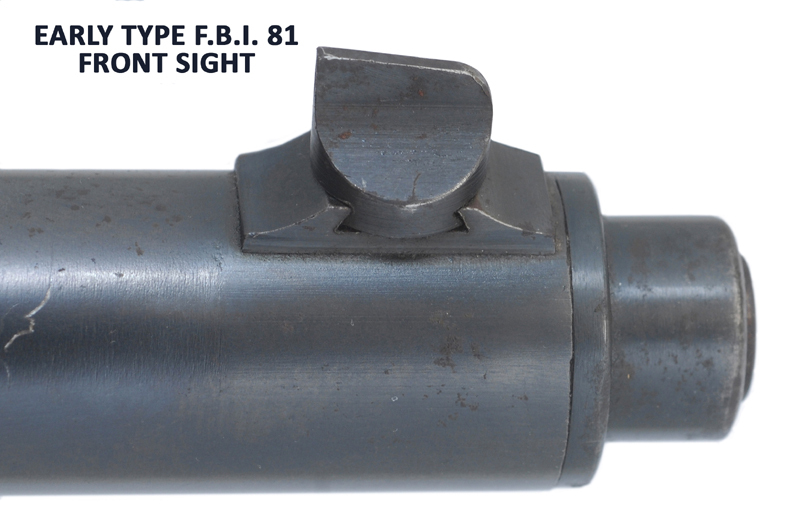 – FRONT SIGHT – Special front sight different than the Early Type FBI front sight. This new sight was called “F.B.I. Partridge Type Front Sight G-C-34”. This specially made sight was not as tall as the Early Type rifle but unique to the FBI rifle. – FIRING PIN – a new type which superseded the standard one piece unit. This part was not observed by the author during this study. – TAKE DOWN SCREW AND TAKE DOWN LOCK WASHER – same as Early Type FBI rifle with shoulder added for lock washer. Although factory specifications list the lengthened Early Type take-down screw, the solitary Late Type rifle observed had a standard 81 take-down screw with lock washer. A distinctive area that collectors want to pay attention to when determining authenticity of Late Type rifles is the joining of the barrel jacket and the barrel jacket head. 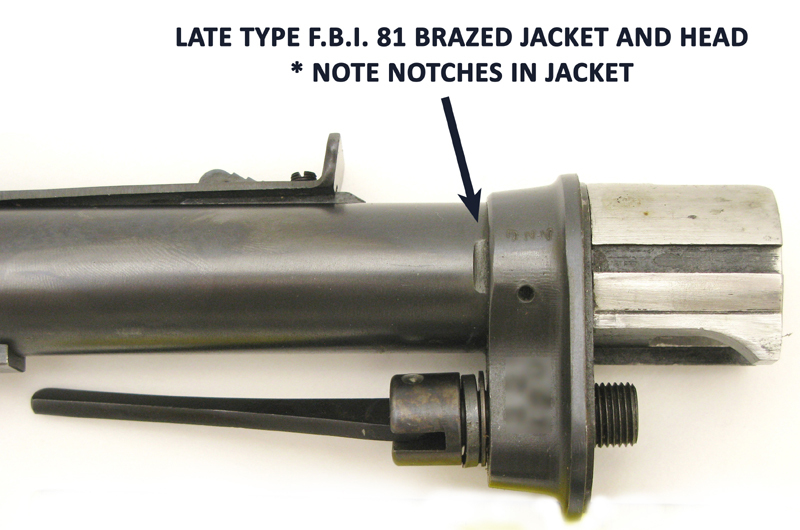 During production the FBI noted that barrel jackets were loosening from the jacket head on their Early Type FBI rifles, undoubtedly due to heavy use. To remedy this problem Remington brazed the two pieces together using induction heat. This process meant no open flame was used as with typical “silver soldering” resulting in a stronger cleaner joint with less oxidation. On standard Model 81’s, which are not brazed, this jacket and head joint is a flush and smooth attachment where the jacket is threaded into the jacket head and pinned. 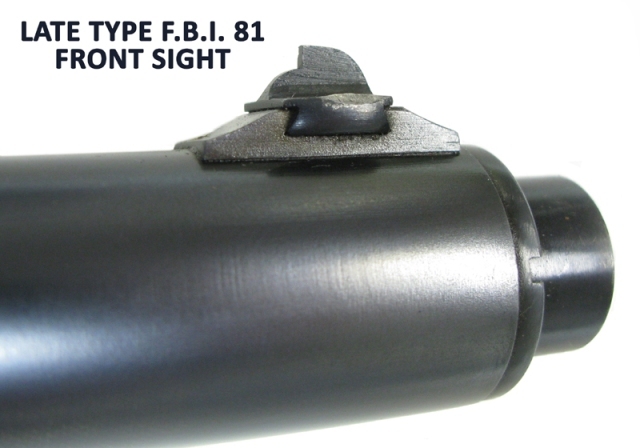 On Late-type FBI rifles, two notches are found on either side of the barrel jacket as it enters the jacket head. These notches were necessary for the brazing process. On regular production Model 81’s, a small pin was used to matte the jacket and the jacket head together exclusively to prevent rotation of the jacket inside the head. On Late-type FBI rifles, which were instead brazed, this retaining pin may be absent or the hole for the pin nonexistent. See pictures for illustration. * Note that Early Type FBI rifles do not have these barrel jacket notches. The rifle pictured below carries a date code of DNN, Sept. 1944 (Remington only manufactured 115 Model 81’s that entire year). This rifle was manufactured 2 months following Remington’s contract with the F.B.I. which called for the late type alterations. The later style “F.B.I. Partridge type front sight” was machined from obsolete sights Remington had in house beginning August 15th, 1944. This particular rifle was found in a Fort Worth, TX gun shop, the seller believed it was just another Model 81. Note the notched barrel jacket – a feature not found on Early Type rifles. – 13 complete rifles and 2 solitary barrel assemblies reviewed. – Of the 13 complete rifles, 12 were Early Type rifles, 1 was a Late Type. – Both barrel assemblies were Late Type. – Date code ranges for the Early Type rifles were from 1941-1942. – All of the Late Type date codes (1 complete rifle and 2 barrel assemblies) were stamped DNN, September. 1944. Many thanks to the Creamer Family and Jack Ahlberg for their contributions to the article. God bless!